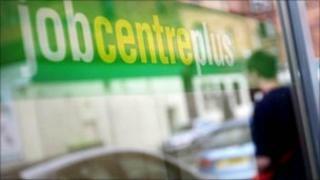 Unions have reacted angrily to plans to close a number of Jobcentre Plus offices, affecting some 2,400 staff. The Public and Commercial Services (PCS) union said five contact centres and 17 benefit-processing sites were being shut. The PCS said it was a "deeply flawed and dangerous" decision at a time of rising unemployment. But a Department for Work and Pensions (DWP) spokesperson insisted front-line services were not affected. He said: "We can't afford to carry on paying for buildings which aren't fully used. "Front-line Jobcentre Plus services aren't impacted by this and we've made sure that all the staff affected have the option of moving elsewhere in the organisation. "In tough financial times we have to operate as efficiently as possible." But PCS general secretary Mark Serwotka said: "This is a deeply flawed and dangerous plan that will remove vital support to jobseekers and people claiming welfare at precisely the time the government's ideological cuts will throw more people out of work. "Instead of cutting jobs, the government should be investing in public services like these to help get people back to work more quickly and help our economy to get back on track." Next week the union is holding its annual conference and is set to hold a ballot for nationwide industrial action by civil servants against the closures and other spending cuts.